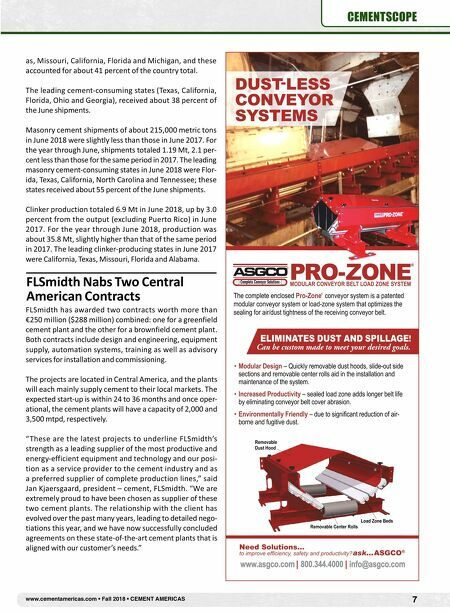 www.cementamericas.com • Fall 2018 • CEMENT AMERICAS 7 CEMENTSCOPE as, Missouri, California, Florida and Michigan, and these accounted for about 41 percent of the country total. 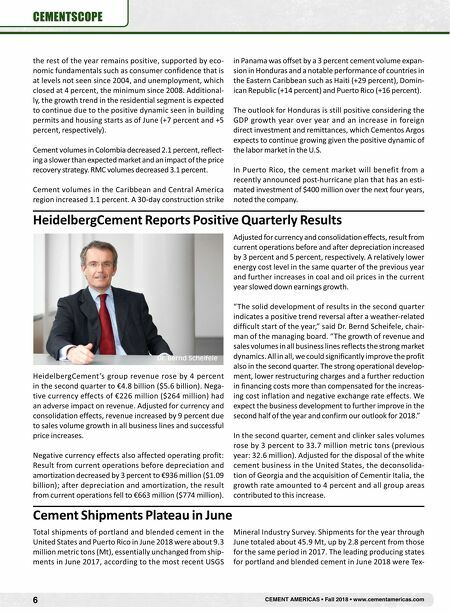 The leading cement-consuming states (Texas, California, Florida, Ohio and Georgia), received about 38 percent of the June shipments. Masonry cement shipments of about 215,000 metric tons in June 2018 were slightly less than those in June 2017. For the year through June, shipments totaled 1.19 Mt, 2.1 per- cent less than those for the same period in 2017. The leading masonry cement-consuming states in June 2018 were Flor- ida, Texas, California, North Carolina and Tennessee; these states received about 55 percent of the June shipments. Clinker production totaled 6.9 Mt in June 2018, up by 3.0 percent from the output (excluding Puerto Rico) in June 2017. For the year through June 2018, production was about 35.8 Mt, slightly higher than that of the same period in 2017. The leading clinker-producing states in June 2017 were California, Texas, Missouri, Florida and Alabama. FLSmidth Nabs Two Central American Contracts FLSmidth has awarded two contracts worth more than €250 million ($288 million) combined: one for a greenfield cement plant and the other for a brownfield cement plant. Both contracts include design and engineering, equipment supply, automation systems, training as well as advisory services for installation and commissioning. The projects are located in Central America, and the plants will each mainly supply cement to their local markets. The expected start-up is within 24 to 36 months and once oper- ational, the cement plants will have a capacity of 2,000 and 3,500 mtpd, respectively. " These are the latest projects to underline FLSmidth's strength as a leading supplier of the most productive and energy-efficient equipment and technology and our posi- tion as a service provider to the cement industry and as a preferred supplier of complete production lines," said Jan Kjaersgaard, president – cement, FLSmidth. "We are extremely proud to have been chosen as supplier of these two cement plants. The relationship with the client has evolved over the past many years, leading to detailed nego- tiations this year, and we have now successfully concluded agreements on these state-of-the-art cement plants that is aligned with our customer's needs."